I marvelled at the stones beneath my feet on the quaint Majorcan beach, glistening through pure, azure blue water. All shades and sizes, thousands of them swept ashore by uncontainable waves riding relentlessly into the bay. Scooping up a handful, I examined the pebbles in my hand. Each one perfectly smooth with curved, though uneven edges. There were no sharp, offensive parts. I began to think about their journey to the shore and imagined that each stone had most likely begun as a jagged piece of discarded rock, thrust into the water and thrown about by the forces of the all-surpassing sea. Stones of all shapes had been continually knocked against each other until they reached their final destination at my feet on this idyllic bay. I couldn’t help consider the parallels with our own lives, as we weather not so much physical forces of nature but rather an array of knocks or assaults. 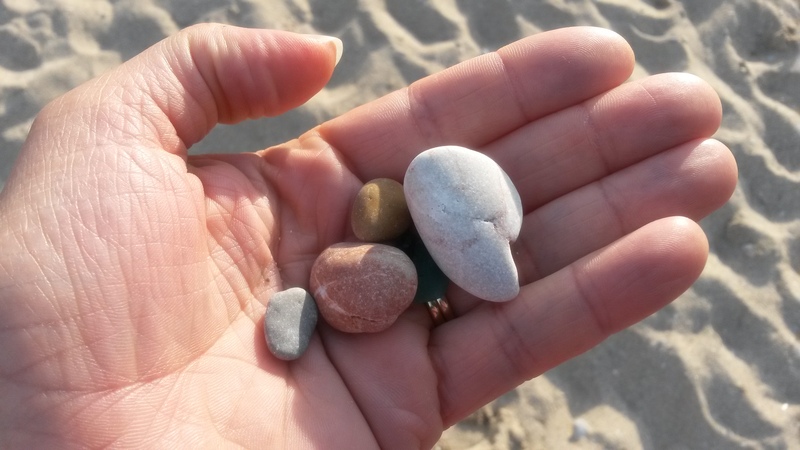 Like the stones, we’re often powerless against torrents and waves that threaten to overwhelm – whether those waves are illness, disappointments, setbacks or perhaps our own personal demons. Wherever we’re at, life’s knocks hurt. But so often they help to hone off the rough edges of our character, making us gentler and more compassionate towards others who are caught up in personal storms of their own. As our worlds collide with those around us, each of us may benefit from the experiences we encounter, however painful at the time. Our rough edges become smoother as we give up resisting interaction or pursuing perfection, and allow our circumstances and experiences to shape us into someone who’s open to being part of a beautiful, evolving tapestry. An individual stone is not particularly attractive or enthralling. It’s only in the picturesque bay or vast beach setting that it assumes aspects of magical imagery. Without engaging others or allowing the water of God’s Spirit to continually run over me, my lone, insignificant pebble of a life remains irrelevant, having little impact. If I let myself be cast into the sea of lives around me, daring to to be affected by those whom I encounter, and in turn touch or influence them, it’s possible for the rough edges to become smoother, without much intervention on my part. The water, which is also an image of God’s Word, can also carry me through whatever turbulence comes my way. No man is a rock. We’re all little pebbles of varying colours from various places jostling for our place in this world as we journey together. When we start to see the big picture, it becomes clear that God’s intention for us has always been community and interaction – both with Him and the people He’s placed around us.